I am loving this book - its definitely one of my favorite sewing books on the market right now. First of all, the title doesn't lie, these are some seriously cute projects, folks. Almost a lethal dose of cute. Not in a bad way. The book is beautifully laid out - love the gingham and polka dots! Jenny's fabric choices are brilliant - I especially love the fact that she used vintage fabrics and pillowcases, with a little bit of cute Japanese fabric thrown in. The book begins with a bio/ introduction as most craft books do, then goes into tools and techniques. I'm excited to find that I have a lot of these tools already (bias tape maker and yo-yo maker) - but I don't know how to use them so I'm excited to learn. Next there's a bit on free-motion quilting and some other "basics" like sewing a zippered pocket. Jenny promises it's not as hard as it looks and I believe her, which is half the battle, I think. If you are a more advanced seamstress, you might skip this part. If you are a more advanced seamstress, you might skip this part. Most of the projects seem easy enough for a beginner so I'm excited to try them. The instructions and patterns are clear and easy to follow. I am loving the necklace tank, fabric button necklace, and reversible headband in the Pretties section. The eyeglasses cozy and appliqued tote are also a couple of my favorites, as is the merit badge wristlet (genius! ), in the Totables section. In the Nest section, I am eager to make the Happy Hostess Dishtowels. Another section for Kid's Stuff includes instructions for a Silly Snake that reminds me of a puzzle my dad made me when I was younger. It also gives you a new use for shrunken sweaters. The Square Bear is also adorable and I love the fact that Jenny incorporates embroidery and vintage buttons. One last section called Crafties includes a crochet hook cozy that makes me want to learn to crochet and a Nifty Needle Book that I really need for my embroidery needles. I love how the projects are not only cute but practical. I read another review that accused this book of being un-hip and to that I say "un-true!" Ok, so I'm not the coolest kid on the block but I do keep up with the latest handmade fashions and as far as I can tell, cute is definitely "in." Besides, if you don't like Jenny's use of mellow fabrics, you can always substitute color combos like black and hot pink or skull prints. Plus the cover gives a good indication of whether the projects will fit your personal style. Personally, I love them. Amy Sedaris is the CRAFT Cover Girl! Hi there, it's Amy here. You know over here at Pimp Stitch, we are Amy Sedaris fans (check out my review of her book I Like You: Hospitality Under the Influence in a previous post). Well, it just so happens that our favorite comedian/author/crafter is featured on the cover of one of our favorite magazines — CRAFT! The party-themed issue hits newsstands on February 10th, but you can get a sneak peek right now: http://staging3.texterity.com/craft/vol10/?pg=44&pm=2&u1=friend. Enjoy! Hey there, it's Amy with another book review for ya! I am excited to tell you about my new book. You all know I am a closet paper-crafty kind of gal so it was awesome to see a "hip" paper crafting book, with lots of great projects by well know crafters. Read on! I was excited to see this book on the shelves - you don't see many hip paper-crafting books and it was a nice change from the bazillions of fiber art books that grace the shelves (not that I don't love those as well). I must fess-up, I was a little worried that the inside projects wouldn't be as cute as the cover (don't you hate it when that happens?!) so I hemmed and hawed over it until I read Jennifer Perkin's review. Fear not! The projects on the inside of the book are every bit as cute as the one on the cover! I usually think of paper crafts (a.k.a. scrap-booking) as being very cookie-cutterish. You know, you buy all the matching papers and embellishments and it's all perfect and matchy-matchy. The "Wood you be mine?" Valentine cards from Two Trick Pony had to be my favorite project. I love the look of the wood + kitschy phrase + the method they used was a simplified silk-screening technique that you can do at home with a few simple supplies. You can view more projects on Craftypod. Another project that I really loved was the felt octopus card with button eyes - too cute! This book serves as great inspiration and really shows that you can break out of the box when it comes to paper-crafting. Most of these cards can be made with extra scraps, recycled materials, and other things you may already have lying around the house. And if you've ever wanted an overview of how to silk-screen or use a Print Gocco then you're in luck! The projects are super-cute, easy to follow, and the book comes with an envelope full of templates. What more could you ask for? Hi, boys & girls, it's Amy here. Today I thought instead of a book review, I'd tell you about a couple of upcoming books that you should be on the look out for! Hey Pimp Stitchers, it's Amy here with another book review for you! I decided to throw another beading book your way, but beware. This isn't your average beading book. It's better! I would highly suggest making projects from this book for your favorite secretary this holiday season. I love Jennifer Perkin's style so I knew right away that I would LOVE this book. And boy was I right. Jennifer says it best in the book intro "If you prefer your jewelry subtle and serious, you might want to go ahead and set this book back on the shelf." This book is not for the faint-hearted! All of the office and secretary references and facts make the book a fun read. The photos are fun and kitschy and will make your mouth water for colorful plastic trinkets a.k.a. what my mother would call "junk!" The best thing about this book is that Jennifer shows us how to go beyond beads. There are tons of jewelry-making/ beading books out there right now, but how many of them tell you how to make jewelry from old motel keys, cupcake toppers, and telephone cords? Not only that, but she does it WITH STYLE. As far as techniques, the book begins with some simple wire-wrapping and jump ring how-tos but then quickly jumps into resin and how to use a hand-held drill. Now that's what I'm talking about. I already own the supplies for both but have been afraid to try them out - until now! There are some amazingly simple projects for the beginning beader. And while the supplies may seem a bit unusual, you'll have many of these things laying around your house (or office)! Kind of makes me wish I was a Naughty Secretary, hording supplies to make jewelry under my desk. Most if not all, of the projects are instant-gratification. Resin casting is probably the most complicated technique used but even that doesn't seem too time intensive. My favorite projects? The tie one on headband is pretty cute, made from a man's vintage necktie. You've got to love the Secretary's Delight (cast resin) bracelet - it's chunky and fun. I'm particularly interested in the Copy Machine necklace - it uses something called UTEE, which I hadn't heard of before. There's even a recipe in here for margarita cake. YUM. This book is fun and funny and just oozes Naughty Secretary Club style, as well it should considering the title! I'm going to hit up my local thrift stores and flee market for supplies and then I'm going to get busy making! This book by Jenny Ryan promises to be cute and sweet (can't you tell by the cover)? I'm loving the color combinations and the practicality of the projects pictured. Look for this one on shelves this February or pre-order on Amazon. I first saw a sneak peak of Kathy's book on her blog and I was really impressed! All of her books are terrific and I'm sure this one will be no different. I love the classy sort of "fiesta" look - if that makes any sense at all? Look for this one on shelves late February or pre-order on Amazon. Hey stitchers, it's Amy here. 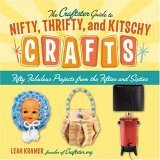 How about a review of a craft book that is not about sewing for a change? Here's a review for one of my favs. I honestly wasn't sure if this book was worth buying at first but I had an Amazon gift certificate burning a hole in my virtual pocket so I decided to give it a try - and I'm glad that I did! You will get several laughs out of this book if nothing else. Amy Sedaris has filled her book full of kitchy imagery and strange humor. Oh - and there's tons of recipes, hospitality advice, and craft projects to boot! If you love to entertain then you NEED this book. An added bonus - Amy Sedaris' cupcakes are the BEST. She takes the cake over Martha anyday! In case you didn't figure this out from the title, each project in this book is made from a set of gloves. Happy Gloves is different from most of the other craft books out there. This book begins like a children's storybook with a photos of every project and a little story about a fat chipmunk (the chipmunk is my favorite project, btw). The use of buttons, hand embroidery, and ribbon as embellishment is genius! After a short story that includes photos of the various projects, there's a sewing overview that explains the different stitches you'll need to know, what sort of gloves to use, how to stuff and knot, etc. The hand-drawn illustrations that accompany this section are adorable! Next comes the step-by-step how-tos. There is a clear set of chronological photos on how to make the chipmunk. From then on, you use those basic steps to complete the other projects. There is a set of illustrated instructions that show you the pattern (where to cut the glove) and specific variations for each project. The diagrams and instructions are extremely easy to follow! The book ends with instructions on how to stitch on the faces. I'm loving the simplicity of both the book and the projects. My favorite projects are the chipmunk, the tiger, the polar bear, and the banana (yes, I did say banana)! Oh, and the toast is pretty cute too. The photos and illustrations are lovely, making this a good coffee table book. Alternatively, the story-telling makes this book appealing for children. Speaking of children, I bet they'd enjoy making their own glove animals and the projects are simple enough that they could do it with a little help. I will definitely be using this book to aid me in my holiday gift-making this year. These softies are cute and sweet and cost nearly nothing to make!